Only two weeks away from the end of 2016, and China's film market is still 2.6 billion yuan away from tying with 2015's total box office revenue. 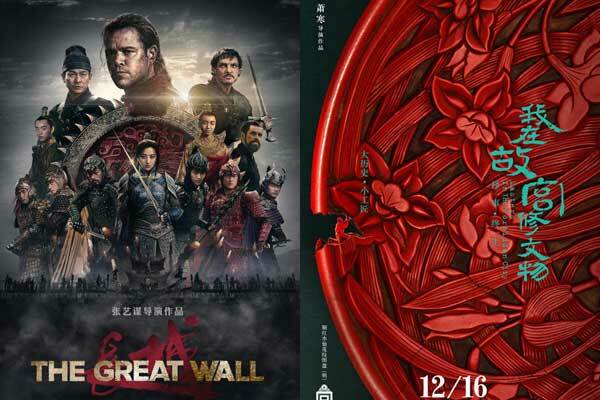 With two distinctively different films hitting the cinemas last Friday, Zhang Yimou's "The Great Wall" and a movie version of the popular documentary "Masters in the Forbidden City", the battle for the box office is in full swing. The Great Wall marks Zhang's first English-language debut and is a hugely ambitious China-U.S. co-production. "Although this film is in the monster genre, it has my own trademark and very strong hints of Chinese culture, just like I did before in my previous films," he said. Meanwhile, "Masters in the Forbidden City" is a more humble production, originally a three-episode TV documentary broadcast in 2015 on China Central Television. The TV version became an instant internet hit, receiving 2 million views and being rated by internet users as one of the most influential documentaries. And this new movie version aims to scan the old Imperial Palace and uncover more secrets with restoration technology. "I feel very happy knowing the documentary has drawn the attention of quite a lot of young people. I believe all filmmakers would like their work to have some impact on young people, who are the future of the world. We need more diversity in the film market," said Xiao Han, director. Although the market did see a growing amount of diversity, this year's stats show that it is not doing well. During the spring quarter of 2016, China's movie market received a whopping 3 billion yuan at the box office. Experts even predicted the yearly box office take would reach 60 billion yuan. But the momentum gradually declined since April and the market didn't perform well during the two golden periods: the summer vacation season and the national day holiday season. Compared to the rapid growth of the past few years, it seems the market is cooling down. "China's box office sales have increased from 1 billion yuan to 40 billion yuan in the past decade as the industry has adopted more market-oriented reform measures," said Zhang Hongsen, director of Film Bureau State Admin. of Radio, Film & Television. "In fact, the film market has posted an average growth of 35 percent year on year since 2003. In 2015 alone, it grew a whopping 48.7 percent. The 2016 market is cooling down. The numbers have their meanings, but what's more important is the quality of the films. " Quality before quantity... it seems that the combination of starry casts, and big budgets no longer guarantees high box office revenues. During the next two weeks, another round of home productions are set to be released, including actor-turned-director Derek Yee's "Sword Master"; "The Ferryman" produced by Wong Karwai, and "Railroad Tigers" starring kung fu superstar Jackie Chan. Maybe one of them will break the box office curse, but one thing is for sure: the whole industry is set to continue its uphill battle next year.